What Dogs Have the Best Disposition? 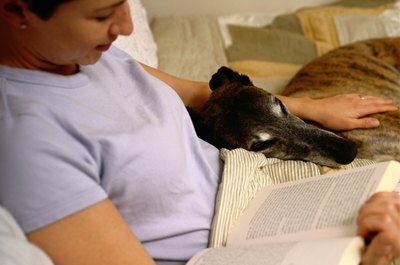 The greyhound is a consummate cuddler. While every dog is an individual, each breed has inherent tendencies toward certain temperaments and dispositions. Some owners prefer a stoic protector while others want a buddy inclined to romp nonstop. With a little research and understanding, you’re sure to find a breed perfectly suited to you and your family. If you’re looking for a gregarious breed, look no further than the three Bs: the bichon frise, beagle and Bernese mountain dog. These friendly breeds are quite tolerant with small children and eager to meet other canines. The easygoing Bernese mountain dog was originally bred as a farmer’s companion, and the merry bichon frise loves to cuddle after playtime. The Peanuts comics may have thrust the beagle into the national spotlight but it’s his curious, playful nature that makes him one of the best family breeds around. Consider the German shepherd or chow chow when looking for a loyal protector. The German shepherd is a great choice for families; they are intelligent, highly trainable and love to play. Great with children and adults alike, German shepherds will go to the ends of the earth to protect their families -- alerting you to strangers and intruders with fearless confidence. The chow chow is less playful than the shepherd, and more suited to a single owner. Fiercely loyal and territorial, the chow chow protects his home and special person with unwavering devotion. Athletes and those who love to hike, run and swim will flip over the most energetic, active breeds. The rambunctious Weimaraner, athletic Dalmatian and adventurous Parson Russell terrier all thrive on exercise. Weimaraners and Dalmatians have seemingly endless stamina and make great jogging partners. The Parson Russell has a wiry, nearly weatherproof coat and boundless energy for a smaller breed. He will, unlike a lot of companions, always be game for a hike when the weather is dreary. For some breeds, their sense of adventure doesn’t reach far past the nearest cushy surface. Cavalier King Charles spaniels, shih tzus and greyhounds are quiet companions who prefer to laze the days away indoors. 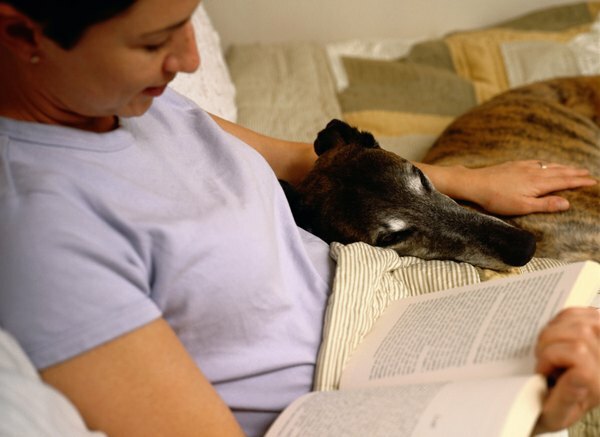 Despite the greyhound’s athletic reputation, this breed is content to snuggle his bony body into a comfortable spot for hours on end. The cavalier King Charles spaniel loves to give and receive affection all day long. However, don’t spend all your time cuddling on the sofa; these couch potatoes still require short, daily walks for optimal health. What Is the Difference Between a Wheaten Scottish Terrier & a West Highland White Terrier? Can You Tell the Breed of a Dog by the Color of Their Tongue?